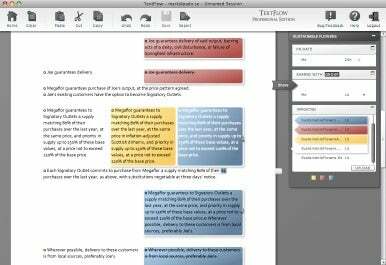 Nordic River has announced posted a significant update to TextFlow, its word processing collaboration system. Available as a Web-based Software as a Service (SaaS). It’s currently in beta, free for the personal version and $100 for a business version. TextFlow provides a Web-based system to let people collaborate on documents concurrently. TextFlow lets workgroups create and edit documents concurrently. It’s already been available in public beta for a little while, and this update provides the ability to store all documents and versions in a “Document Home” on the TextFlow server. The server maintains a full history of each document, and lets you share documents with individuals or groups you select. Other improvements to TextFlow include “usability” changes, the ability to have multiple versions analyzed faster, the removal of limits on the size of the documents, and the ability to export finished documents to .doc, .pdf or Web formats. Based on Adobe Interactive Runtime (AIR), TextFlow works on multiple platforms, including Mac OS X, Windows and Linux. System requirements call for Mac OS X 10.4 or later and any Web browser that supports Flash 9 or above.